Lini Gong (soprano) was born in 1981 in Zhuzhou, Hunan (China). She began her singing studies at age twelve, and studied at the Shanghai Conservatory of Music with Prof. Xiaoqun Chen, as well as at the Hamburg Conservatory (Hochschule für Musik und Theater) in the class of Prof. William Workman, and the singing class of Prof. Burkhardt Kehring. In 2007 she graduated with honours in „Lieder and Oratorio“ singing. 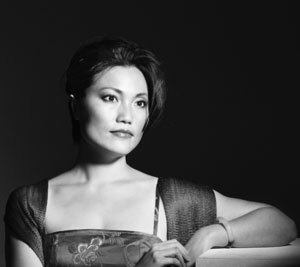 Since 2006 Lini Gong has been coloratura soprano solist at the Freiburg Theatre. She also appears regularly as guest artist in other European theatres. In 2009 she performed „Blondchen“ („Die Entführung aus dem Serail“, Mozart) at the Lucerne Festival and in the same year she was active as guest performer at the Stadttheater Stuttgart and at the Landestheater Linz.